For many years, I've been meaning to head to Kankakee. The sand prairies at the border of Indiana and Illinois harbor some unique species to the Midwest. 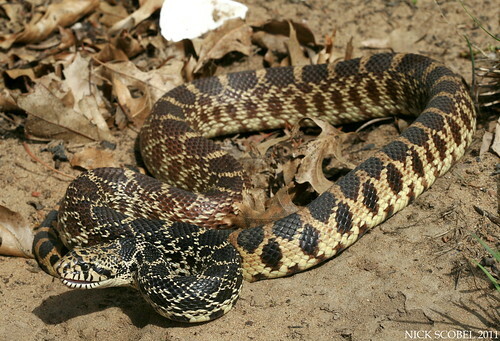 One species in particular had grabbed my interest, the Bullsnake. 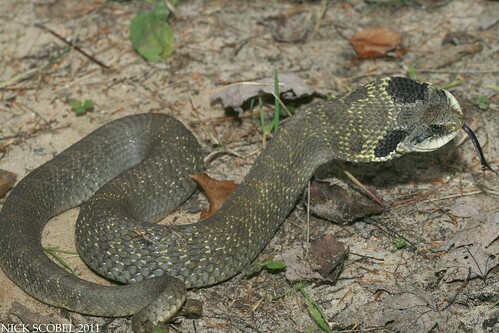 Like the Northern Pine Snakes I encountered in New Jersey this summer, the Bullsnake is a member of the genus Pituophis. These snakes are large constrictors which prefer sandy soils where they can burrow, namely in search of prey and to lay eggs. 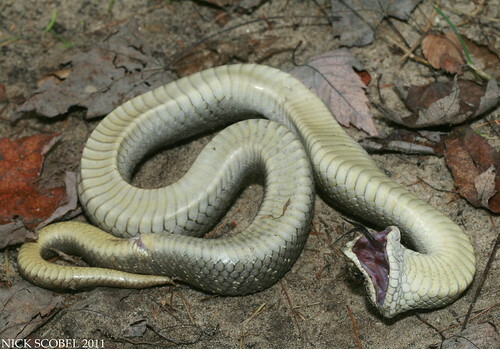 Members of this genus are also formidable to meet in the field, as the larynx has a characteristic epiglottal keel, which allows the snake to emit a very loud and raspy hiss. 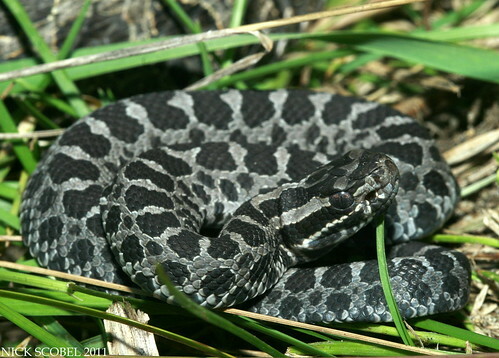 Though quite imtimidating, Bullsnakes are completely harmless and play a vital role in the ecology of the Indiana & Illinois sand prairies. I drove down one morning in May to meet Todd Pierson, his dad Jeff, and John B. to hit the prairies in hopes of turning up a few species. Artificial cover is the name of the game in the area, and we began to hit as much tin, boards, and junk as possible before temperatures got too hot. It didn't take us long to hit paydirt as Todd's dad found this nice looking milk underneath some siding at our first stop around quarter to nine. For an adult milk, this was a nice looking specimen as many individuals of this species get rather ugly as they age. We didn't spend too much time photographing this snake due to rising temps, so we quickly moved on to a few more sites. The ticks were really bad in this area, and I pulled more than two dozen off of me throughout the course of the day and even found a few stragglers hanging on after the four hour drive back to Michigan. The next few sites yielded some common species including a racer, juvenile milk snake, and a few garter snakes. A glass lizard was seen but got away before anyone could get their hands on it. We also drove past a monster DOR Bullsnake that had been hit the day before, easily in excess of six feet. After a few more stops and a lack of Bullsnakes, I was beginning to become a little bit discouraged as the temperatures had risen in to the low 80s with high humidity. We made one last stop at a heavily herped spot with tons of cover. I flipped this less attractive milk within a few minutes. I snapped a few photos of this snake, and then handed it off to Todd and continued on flipping. Eventually I came to rather small and unassuming piece of cover in the open and decided to flip it anyway. I'm glad I did, as this was found underneath. This was an exceptionally marked snake. Yellows, browns, blacks, oranges. I grabbed the snake and was greeted with a loud hiss and a few strikes, which made photographing this snake a real treat. I had wanted to see this species for quite some time, and being able to get one under cover with such hot temperatures was extremely lucky. I only had a day to spend in the area, but plan to head back next year in hopes of finding a few more bullsnakes, a glass lizard, and if I'm really lucky, an ornate box turtle. That's all for now. Until next time, happy herping. 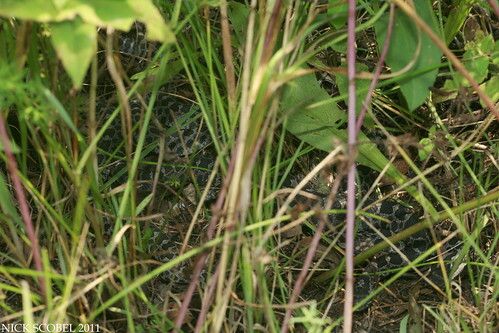 The Eastern Hognose Snake is a challenging species to find in the field, and is my personal nemesis. Before last October, I had only seen one in my lifetime. 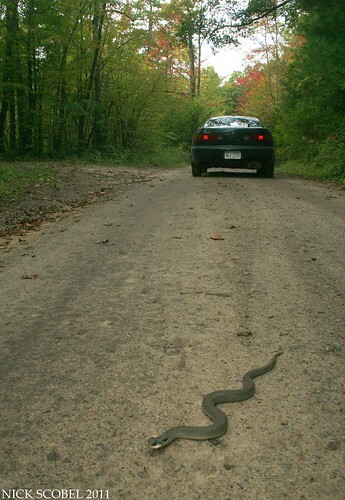 Then I cashed in on one at Snake Road last fall and then finally got one in Michigan earlier this spring. Hognose snakes are a tough species to figure out, as they are likely found throughout the lower peninsula where good habitat exists. I had always associated them to be in the western and northern reaches of the state, but recently I've found that they can be found even in suburban southeast Michigan as I found my first one in Michigan since I was a kid less than ten miles from my house earlier in the spring. 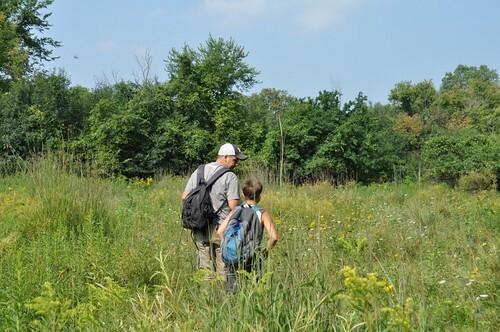 Last Friday, I had an open afternoon and decided to head down to an area I frequent in hopes of finding some snakes on the move. I've seen quite a few species in the area including Blue Racers, Northern Ribbon Snakes, and Northern Red-bellied Snakes, so I was hoping I could score on of these species driving roads like this one. After cruising a few Eastern Garter Snakes, I went past a snake on the edge of the road that had some wild patterning on it. I didn't get a great look at it, but had no idea what it was based on the brief glimpse I had gotten. So I backed up and looked over to see this flattened on the side of the road. A DOR Hog, right there. I'd been herping this area for a few years now and have suspected that Hogs were in the area, but hadn't seen a clear sign of one until this day. It was a beautiful yellow/orange color and had likely been hit an hour or two before I arrived. The snake was in decent shape, so I bagged it up and brought it back to my place where it is now a part of the herp collection at CMU's Museum of Natural History. I was a little discouraged after finding the snake, but it was a bittersweet feeling to know that hogs were definitely in the area. I decided to keep driving roads in hopes of finding some more snakes on the road. 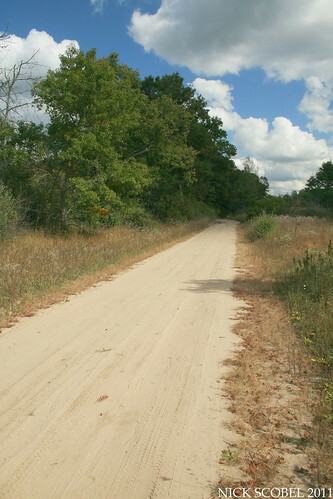 A large Blue Racer crossed the road about 30 yards in front of me, but I wasn't able to get to it in time. 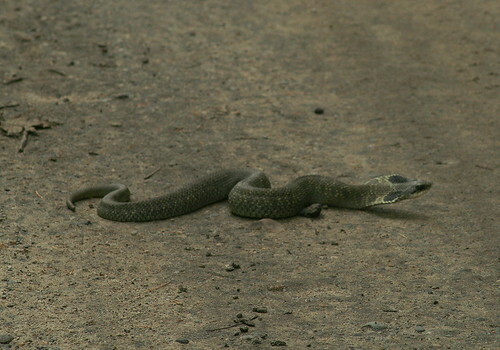 Later on in the afternoon, I turned down a road I've been down many times and noticed a fat snake moving across the road. Sometimes it's better to be lucky than to be good at something. In this case, I just happened to be in the right place at the right time. I couldn't believe that right there in front of my car was a live hog, less than an hour after seeing a DOR. I jumped out as quickly as I could and ran over to begin snapping some shots, the snake lived up to its reputation and put on quite a show. This snake was an awesome surprise and one of my favorite finds of the year. Hognose snakes are an awesome species, and I wish I got to see them more often. But seeing two live and one dead in Michigan this year is pretty good in my book. It seems that this species is almost impossible to target, and they just sort of show up randomly from time to time. Perhaps I should take up birding in good areas without looking for them, then more would show up I'm sure. That's all of now. Until next time, happy herping! While most of my weekend field time in New Jersey was spent in the pine barrens, I also made it a point to explore where the Appalachians extend through the northern part of the state. The mountains of northern New Jersey are highest along the Delaware River, which divides New Jersey and Pennsylvania, this range is known as the Kittattinny Mountains or Kittattinny Ridge. Farther north, the mountains become more rolling and less jagged but still provide excellent habitat for a plethera of montane species. On my first weekend, I headed to the mountains and hit a popular area and snapped this picture from the New Jersey side of the Delaware River. 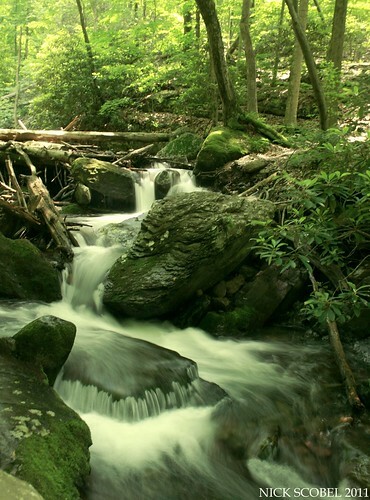 Many of the environments of the New Jersey mountains involve erosion from various mountain streams that have carved out the areas topography over thousands of years. These streams and seepages form habitat for various amphibian species, especially the salamanders. Though the diversity of the salamander species is nowhere near as great as in the southern Appalachians, the northern Appalachians still have some nice species of caudates. 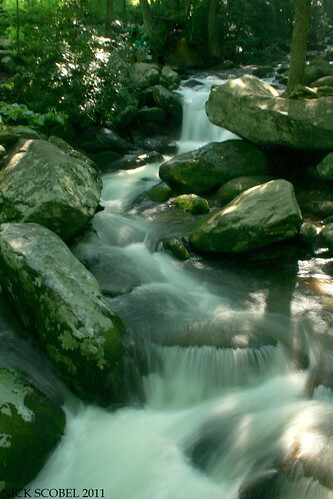 A typical mountain stream from northern New Jersey, lined with thick stands of rhododendron. I spent my first day along this stream and similar streams nearby in search of some of the stream dwelling species in the area. 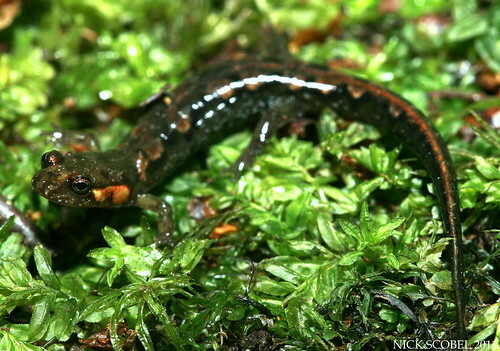 Most species at these elevations are Plethodontids, or lungless salamanders, which capitalize on the amount of moisture in the area and breathe through their skin. Some of these species can be absolutely striking, like the Northern Red Salamander. This beautiful species is found throughout much of the eastern United States, especially in areas where seepages and streams abound. Though common in the mountains of New Jersey, they can also be found in seepage areas within the pine barrens. Red Salamanders can often be found wandering across roadways at night after a heavy rainstorm during the summer months, their bright red coloration is hard to miss on a roadway. Like the Northern Red Salamander, the Northern Two-lined Salamander can also be seen crossing roadways in the summer months after an evening shower, though this species tends to stick to streams more than the Red Salamander. This species is the common "yellow" salamander of the northeastern United States, and can be readily found under flat rocks and other cover along stream edges. 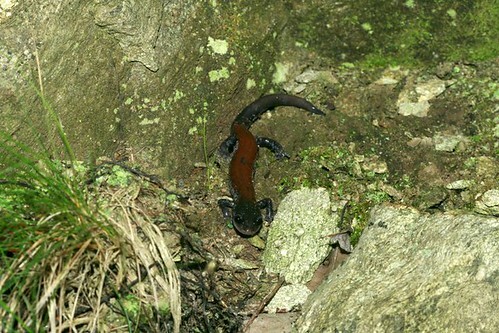 But salamanders aren't just restricted to streams in the mountains, they can also be found on wooded slopes. 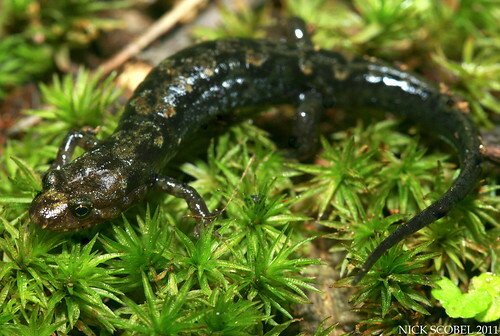 The Northern Slimy Salamander is a striking species which inhabits wooded slopes in the eastern United States and can be extremely abundant in the right habitat. They get their name from the sticky substance which they secrete when handled, it can be extremely difficult to wash off the hands. Juveniles (top photo) are completely black with white spots, while adults (bottom photo) are black with white spots, but tend to have a more gray tail. The tail is extremely fat in this species, and that is because major fat reserves exist in the tail which this species uses up over the course of the winter to survive. Other common salamanders in these areas inlcude Northern Dusky Salamanders and Red-backed Salamanders. Many of the rocky streams in the mountains provide habitat for two protected turtle species, particularly this striking turtle. 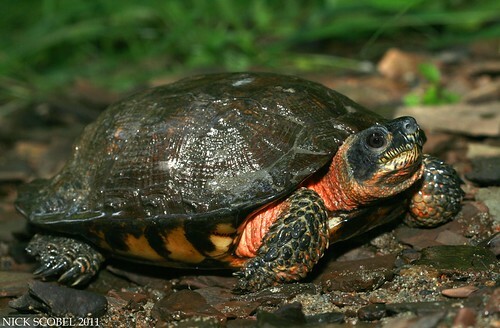 The Wood Turtle is a Threatened species in New Jersey, and is only found in suitable stream habitat with adjacent woodlands in the northern half of the state. This adult female was found walking along a stream bank in the mountains, likely in search of food. Wood Turtles have suffered severe declines in the northeast due to habitat loss, road mortality, and illegal collection for the pet trade. Preserving suitable stream habitat and educating the public is critical for this species long term survival in New Jersey and the rest of the northeast. This striking adult male that was found crossing a road after a heavy afternoon thunderstorm in northern New Jersey. 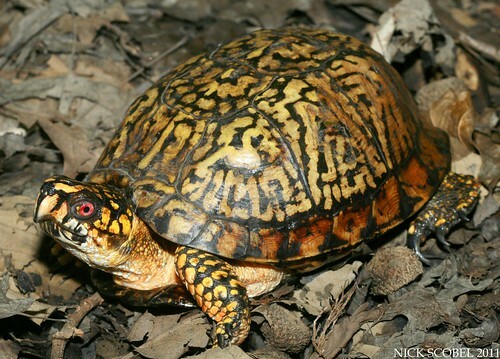 Throughout their range, Eastern Box Turtles suffer from habitat loss and road mortality. And though this species seems to be extremely abundant in New Jersey, it still receives legal protection against collection and harassment and is listed as a Species of Special Concern by the NJ Department of Fish & Wildlife. 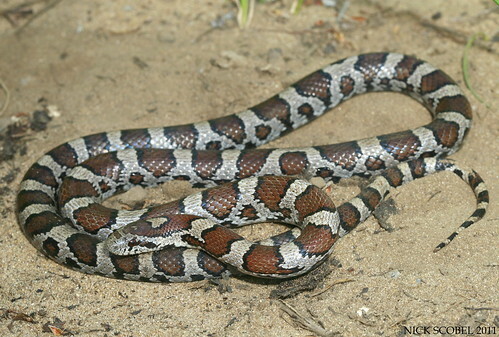 The highlands of New Jersey are also a haven for several species of snakes. 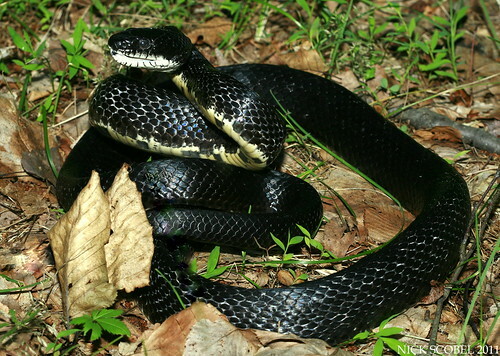 The Black Rat Snake is a large constrictor which inhabits woodlands in the eastern United States, it is most common in New Jersey in the mountains. I found this monster crossing a mountain road just before dark on a warm evening in June. I also saw several individuals under cover such as tin, boards, and fallen roofing throughout the course of the summer. 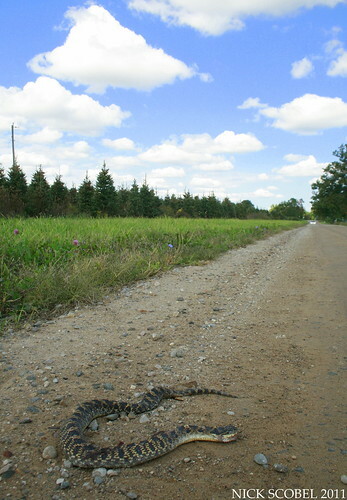 Seeing snakes on roads was a common occurance this summer, although sometimes you find them in a way that is upsetting. The copperhead is another snake species which historically had a small range in New Jersey to begin with, and with development and habitat loss has declined significantly. 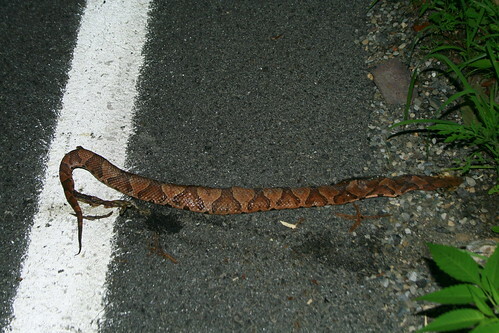 The Copperhead is listed as a Species of Special Concern by the NJ Department of Fish & Wildlife and is protected by law. Most of the individuals I saw this summer were DOR, but I did manage to find a few live specimens. The copperhead is a master of camouflage. Lying amongst leaf litter it can be almost impossible to spot even when you're looking for them. Like most North American pitvipers, Copperheads are ambush predators. They will lie motionless until a passing rodent gets too close, and then it's lights out. Because I don't get into their range terribly often, I'm always pleased when I can see one. One of the toughest things to stomach during my summer in New Jersey were sights like this. 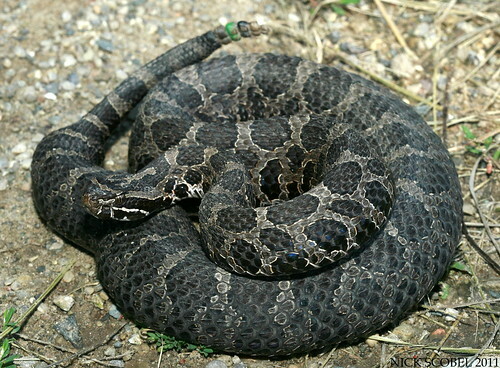 The Timber Rattlesnake is an Endangered species in NJ, and two of the greatest threats to its future in the state are road mortality and persecution by humans. 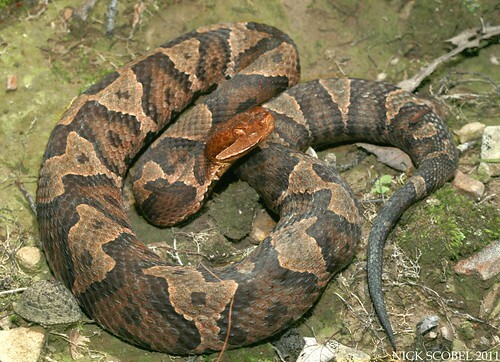 Like many venomous species, the Timber Rattlesnake is an extremely misunderstood animal. Most are quite shy, and just want to get away. 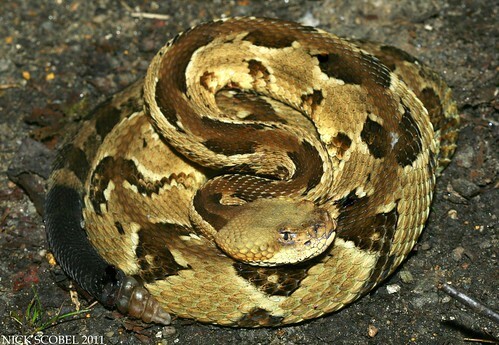 Yet, many people still hold on to the ignorant belief that these snakes are extremely aggressive and dangerous. Unfortunately, ignorance leads to this sort of scene. 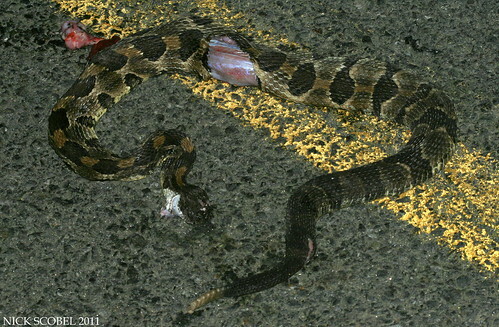 This particular snake had been run over in an area where the speed limit is 15 mph. 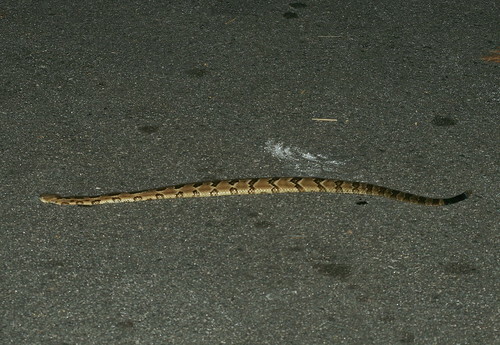 It's rattle had been cut off and it was likely run over intentionally, as these snakes are tough to miss on a road, especially when the speed limit is so low. As you can see, this was a common sight throughout the summer. 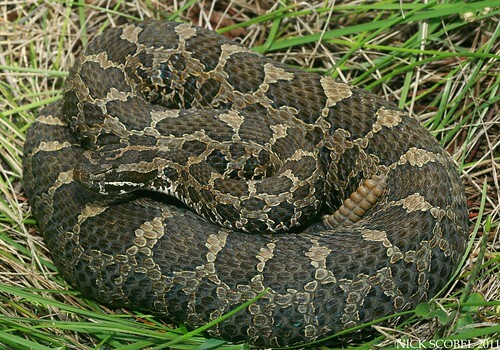 The Timber Rattlesnake has an extremely fragmented range in NJ, with one population being restricted to the northern mountains and and even smaller population being isolated to the pine barrens. 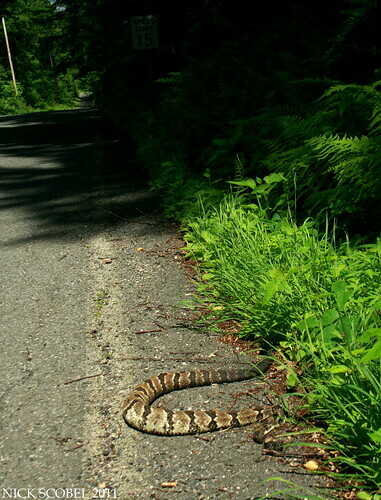 Though it is clear there is an abundance of Timber Rattlesnakes in the mountains of New Jersey, the fact that almost all of the snakes I observed had been killed on roadways is alarming. 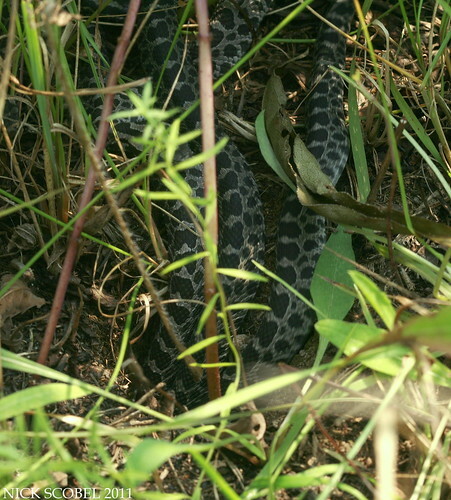 Continued monitoring and outreach to the public are essential if this snake is to continue to survive in the state. Timbers come in two distinct color phases in the northeast, yellow and dark. However, there is a lot of variation in the two phases. 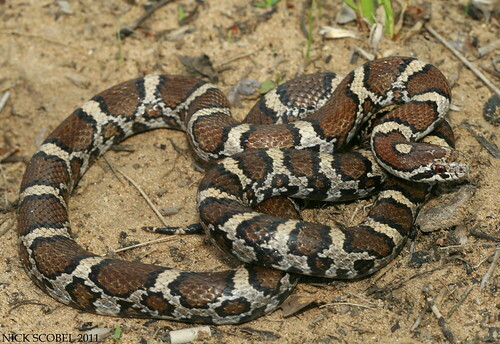 The snake pictured above is a classic dark phase, with a bit of a chestnut stripe running down its dorsum. The Timbers of the northeast are much different than those I had seen previously in the midwest (Ohio, Indiana, Illinois) and down south in Florida. 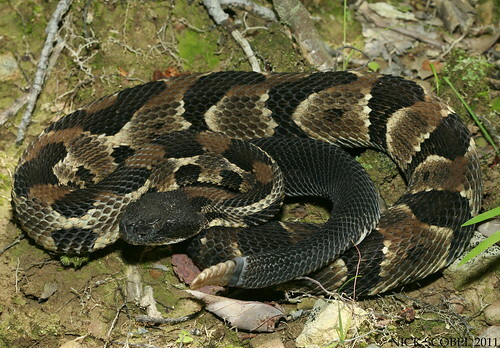 Timber Rattlesnakes are an integral component of mountain ecosystems, and are a necessary presence for the control of small mammals such as squirrels and chipmunks. New Jersey's mountains gave me a lot of cool encounters and are a beautiful place to visit, I hope to return someday once more. Every now and then an opportunity comes along and you decide whether or not to partake in it. About a month ago, my dad had told me about a young boy who he had met at one of his astronomy club meetings. He mentioned that the kid was very bright, and seemed to have a pretty keen interest in herpetology and that he reads this blog and my website fairly frequently. I was intrigued, and decided to contact the young herper and gauge his interest. Justin is 12 years old, but is extremely knowledgable in the world of science and his interests include herpetology, astronomy, physics, rocketry, and paleontology. After coordinating with his family, he met me on a warm August morning in hopes of seeing his first Eastern Massasauga Rattlesnake in the wild. His mom and sister tagged along as well, and after some brief introductions we were off. We headed to an area where I knew several gravid females have been hanging out throughout the course of the summer. Not being huge fans of snakes, his mom & sister elected to stay out of the tall grass, but Justin and I headed in to try our luck. After a few minutes of traversing the field slowly, I noticed a large female laid out in the morning sun. Justin came over slowly and was pretty astounded at the snake, this is a big female that I've seen several times and she always is noisy. The look on Justin's face is worth a thousand words. 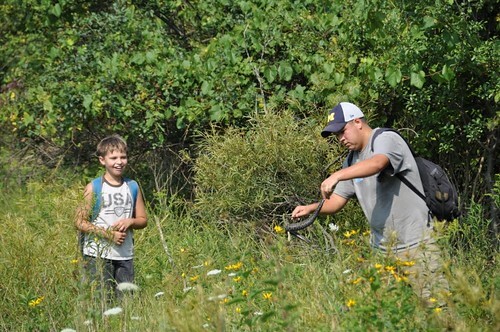 His mom captured this photo as I lifted the snake to give Justin a better look, it reminds me of how I felt when I saw my first rattlesnake when I was right around his age. This large gravid female harbors right around the 30" range, a very healthy & large specimen for this species. Although she was a bit noisy, she was very relunctant to hold her ground and sit still for photos. Justin's mom and sister decided to come have a look, and were surprised by how docile these snakes are. We hung out with the snake for a little while before parting ways. Shortly after, we headed to another area where I've seen Massasaugas in the past as well. After only a few minutes, I heard a faint buzz and noticed a female coiled in the tall grass nearby. As I was getting my camera gear out, Justin pointed out a pile of 7 or 8 freshly dropped neonates less than a few feet from the female. This was something I had never seen before until a few days earlier when I saw a very similar scene at a different site, seeing something like this twice in the span of a few days was incredible. Justin was so excited, and I told him how lucky he was to see something that some people who have researched this species haven't even seen. After getting a good look at the mother, it turned out to be a female I saw a few days earlier nearby. Here she is, pre-birthing. It was quite a morning, and something I won't soon forget. I can imagine that Justin felt the same way. He has way more knowledge than I ever did when I was his age and has an outstanding future ahead of him. These are the type of kids we need to encourage to continue to grow and follow their passions, as they will be our researchers in the future. If you know someone who is interest in wildlife, don't hesitate to expose them to it. People won't want to conserve something of they don't admire it. That's all for now. Until next time, happy herping. A heavy fog hangs over the Spruce-Fir forest at sunrise. I'm atop a mountain in the southern Appalachians in search of salamanders. 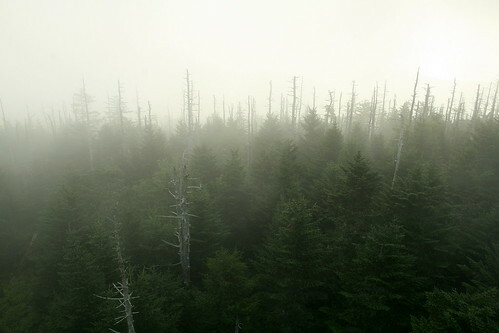 It's no wonder where the Great Smoky Mountains get their namesake, the fog is thick and cool. For the second year in a row, I ventured south to Tennessee & North Carolina in search of some salamanders which only occur in this region. After a 10 hour drive from New Jersey, I arrived in the national park a few hours before sunrise. After a quick few hours of sleep in my car, I was hiking a trail to a mountain top just before sunrise. 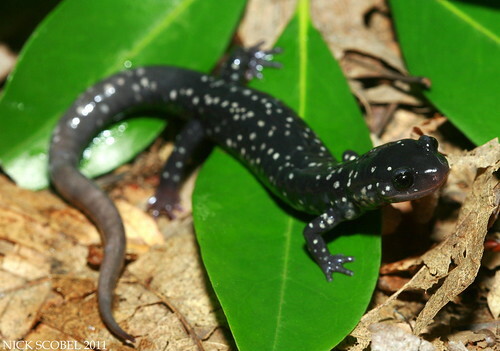 The Smoky & Blue Ridge mountains receive excessive amounts of rainfall each year, creating damp forests which served as the epicenter for Plethodontid salamander evolution over the course of thousands of years. Salamanders from the family Plethodontidae are lungless salamanders, breathing is achieved through the skin via a process known as cutaneous respiration. This process requires the skin to be moist, so its easy to see why the southern Appalachians served as the epicenter of evolution for this family of salamanders in North America. Within a few minutes of flipping cover in the high elevation Spruce-Fir forest, I found my target. This beautiful salamander species is abundant in higher elevations of the park. 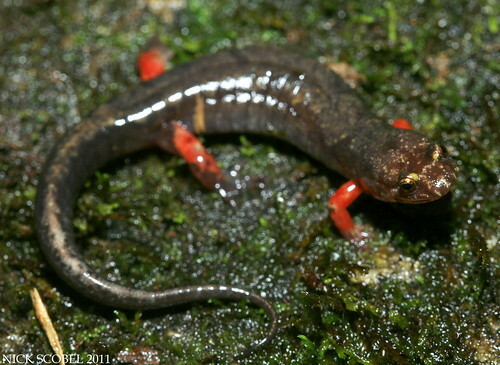 It is easily distinguished by its bright orange cheeks where it gets its other name from, the Red-cheeked Salamander. 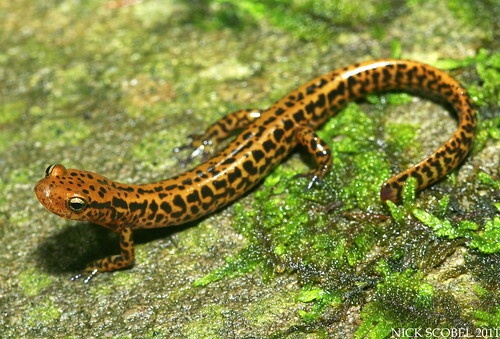 Bright colors usually indicate a warning in nature, and the Jordan's Salamander is no exception as it is quite toxic to the point that most animals will avoid eating them. Other salamander species in the region have taken advantage of some outstanding mimicry to avoid predation. 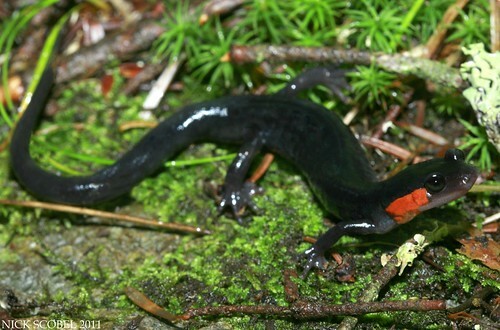 This Desmog species disguises itself to resemble noxious species, like the Jordan's Salamander. 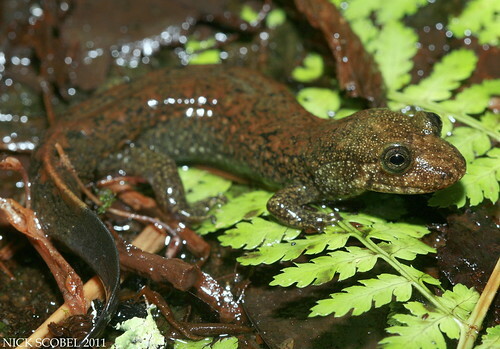 The Imitator Salamander is an extremely abundant species which only occurs inside the limits of the national park. Most are distinguishable by their bright orange cheek patches, but some individuals maybe be completely dark, like the individual pictured below. 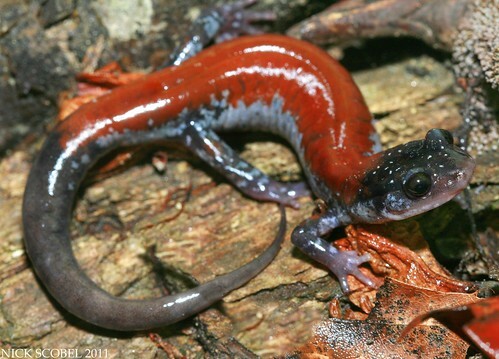 The Ocoee Dusky Salamander exists in the mountains of western North Carolina, where it shares habitat with the Red-legged Salamander (Plethodon shermani). 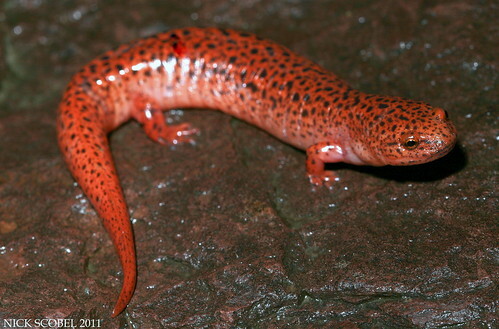 Like the Jordan's Salamander, it is noxious and is usually avoided by predators. 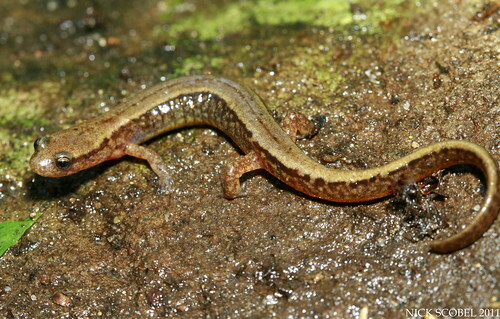 The Ocoee is interesting though, as some individuals also exhibit red cheeks, though the Jordan's Salamander is not located anywhere near where the Ocoee is found. It is likely that this is a trait is a remnant from the evolution of the Ocoee throughout the course of thousands of years. 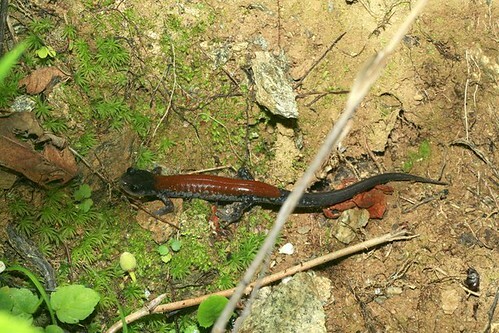 While at a lower elevation stream near Cades Cove, this salamander was found. This brightly colored species is common throughout lower elevations of the park, where it can be found under cover along streams, creeks, and even it wet rock crevices. It gets its name for its abnormally long tail in proportion to its body, though the individual in the photo above had lost a good portion of its tail and was only beginning to regenerate it. After spending a short time in the lower elevations of the park, I decided to swing over to some of the larger order streams to search for a few larger species in the park. 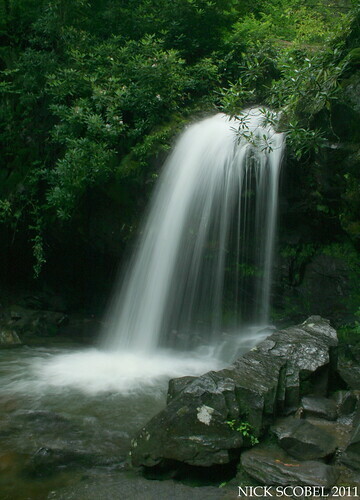 These more powerful streams are home to some of the larger salamanders in the Smokies, such as the Black-bellied Salamander and Shovelnose Salamander. Though I didn't find any marmoratus this year, the Black-bellied Salamanders were out in full force. These big bruisers are one of the largest species of the genus Desmognathus, and are often seen in some of the roughest current areas of streams clinging to large rocks. Their attitude is something to be appreciated, as I've had several individuals nip at me when trying to extract them from a crevice for photos. This species gets its name for the dark gray belly, but adults can be extremely variable and are often confused with the Shovelnose Salamander (Desmognathus marmoratus). Shovelnose are much more aquatic than the Black-bellied and also exist in smaller order streams. A view that I will miss, the Smoky Mountains are an amazing place. Later on the evening, I set off for a location in North Carolina that I purposely set aside for last. It is home to salamander species that I've wanted to see in the field for a long time, the Yonahlossee. On my way to the site, I happened to round a corner on a forest road in the NC mountains and saw this ahead of me. Timber! I managed to swerve around this snake and pull off on the side of the road. This was an enexpected, but very welcome find as I don't get to see this species very often. This was a fairly young Timber Rattlesnake, right around two feet in length. Though it is not protected in North Carolina, this species is experiencing declines statewide due to habitat loss, road mortality, and persecution by humans. 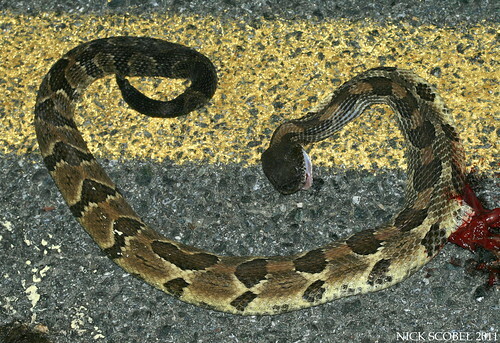 If it had been any other motorist this snake would likely be dead, as many rural residents of NC routinely run these species over intentionally. 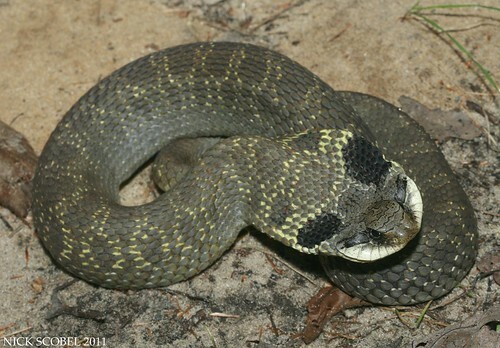 It's a shame, as the Timber Rattlesnake is an integral part of many NC ecosystems. After shooting a few photos, we parted ways and I was off to my final stop of the trip. I arrived on a remote talus slope in the NC highlands around midnight, and began to scale the hillside with my headlamp on. It wasn't before long that I saw a sight that I've wanted to see for a long time. 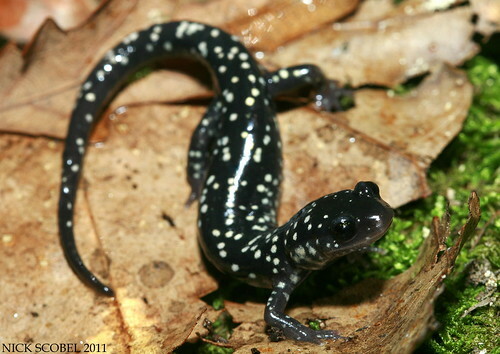 The Yonahlossee Salamander is an extremely large Plethodontid which is found only at high elevations in a few places in Tennessee, North Carolina, and Virginia. 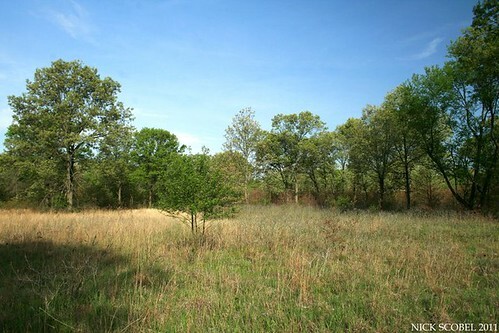 It prefers rich, forested slopes with talus and old windfalls where it emerges from a burrow at night to forage. First describes by E.R. Dunn in 1917, the species received its name from Yonahlossee Road near the original collection site in North Carolina. Yonahlossees are large for a Plethodontid, the individual above was easily seven inches in length, some attain even larger lengths. This was the only Yonahlossee I handled the entire night, I was content to watch the other dozen or so I saw on the prowl on a talus rock face. Though my trip to the southern Appalachians was shorter than my trip last year, it provided with me with just as many memorable experiences and surprises as the year before. I just might have to make another trip down sometime to get one or two species that I'd still like to see. That's all for now, until next time, happy herping!